If you’re a chain restaurant/brewery (and there are a lot of you), then you’ve got to do something to stand out from the crowd. For the Rock Bottom Brewery, originality comes in the form of forgoing dishware altogether. From what we witnessed, the pretzels and beer flights come out in wire carriers with handles, and our nachos arrived not on a plat but on a raised metal stand with a tray on top. They may have been trying to stun us with their presentation, but a word of advice: we aren’t super short ladies, but we found this towering display too high to get proper perspective on chip selection, and exceptionally messy to eat from. There is also the lurking danger of dropping a topping off of the plate or on your chip into your beer. 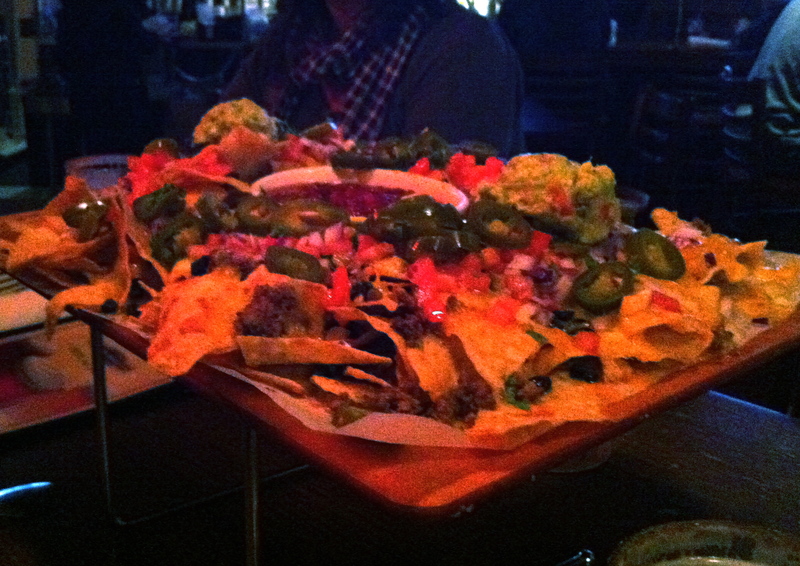 Appearance: (7) Once again, flat nachos! What they lacked in a 3rd dimension they definitely made up for with the other two, as these elicited gasps of surprise as they graced the table. Twin scoops of guacamole elegantly framed a languid pool of salsa. Quality of Ingredients: (5) “Greasy” is one of the first words that comes to mind. Ground beef was the topping on these nachos, and it definitely suffused the plate in fatty residue, compounded by the already somewhat greasy chips. While the beef was moderately unflavored, taco seasoning made it’s appearance on the black beans. We did enjoy the just-right jalapenos, and the guacamole was excellent. Still, a little too heavy to really devour. Distribution of Toppings: (7) Despite the low profile, the cheese didn’t make it everywhere it was supposed to; slightly hardened cheese and greasy chips only made it stick less. Salsa and guacamole were well-placed, allowing for sampling but not getting in the way. Price: (6) With the add-ons of meat and guacamole, these were up there in price. Large for sure, but not entirely worth it. Overall: 25/40. A mediocre nacho on an unusual serving vessel is still just a mediocre nacho. There used to be a great seafood Italian café here in Dallas. They had Italian nachos which consisted of deep fried fresh pasta “chips”, mozzarella & provolone, real crab meat, artichoke hearts, pepperoncini rings & seasoning. Damn, I miss them. One of my favorite unusual nacho toppings are hot pickled quail eggs (quartered). I pick up a few jars every time I’m in south Louisiana.